We’re not talking that ordinary droopy hummus that you sometimes get as a side/ dip with ‘em veggies. We’re talking creamy, fluffy, smooth as silk, packed choc-a-block with nutrition hummus that just teleports you right on to heaven! Pair it with pita, veggie fingers, sandwiches, idlis and dosas even – easiest way to balance your meal options. 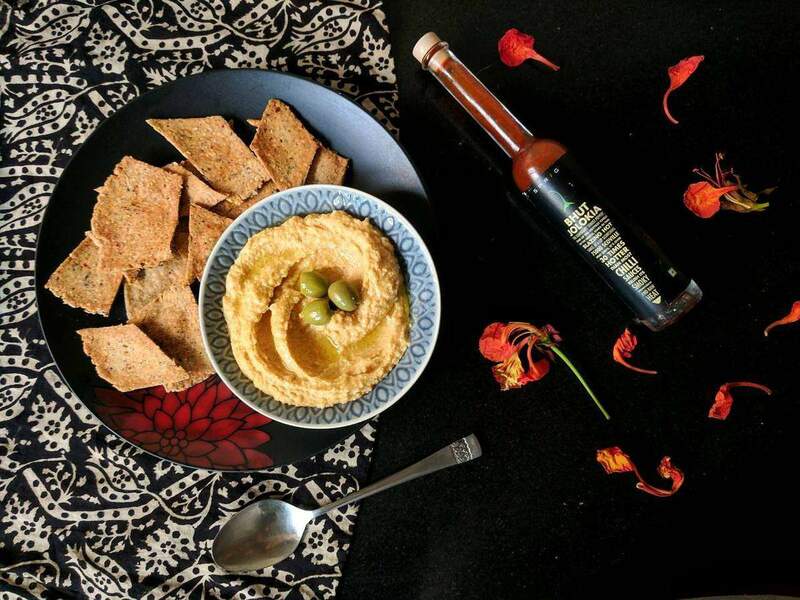 If you’ve been following my Instagram feed for a while now, you know of my obsession with hummus/ houmous and how I refuse to let go of it 😀 In fact, I’m very surprised to note that I haven’t done a recipe post so far – that’s how much of a favorite staple food hummus is for me! 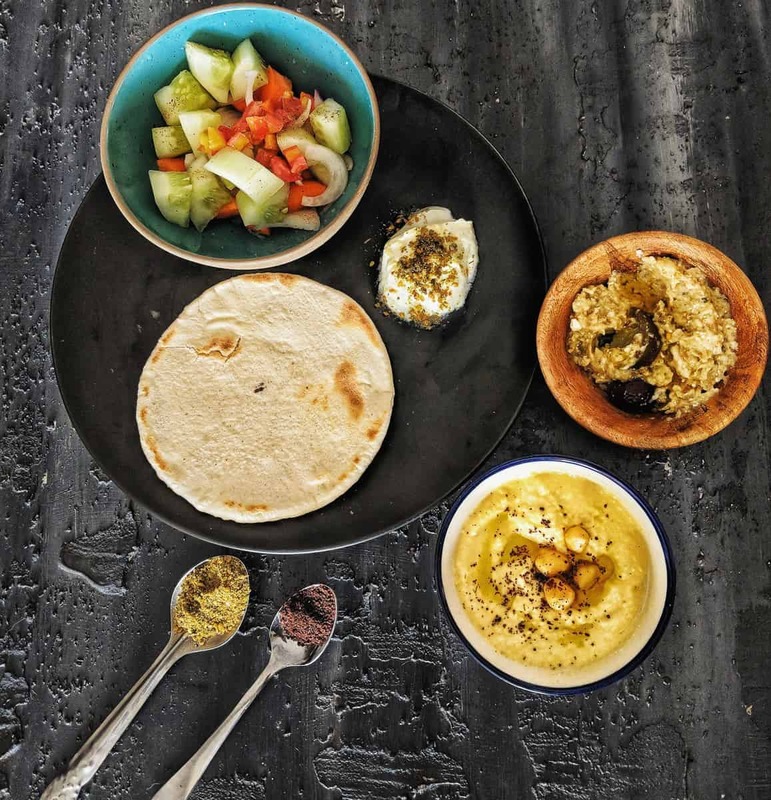 Whole wheat pita bread, fresh veggies, feta baba ganoush, hummus and labneh – a spread to die for! 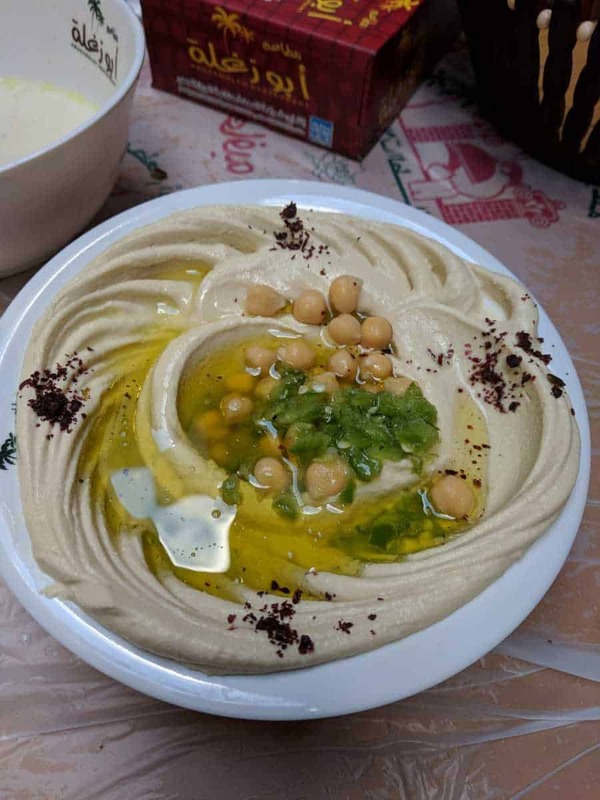 The classic Hummus bowl at Hashem’s in Dowtown Amman, Jordan. Simply the best I’ve ever tasted! 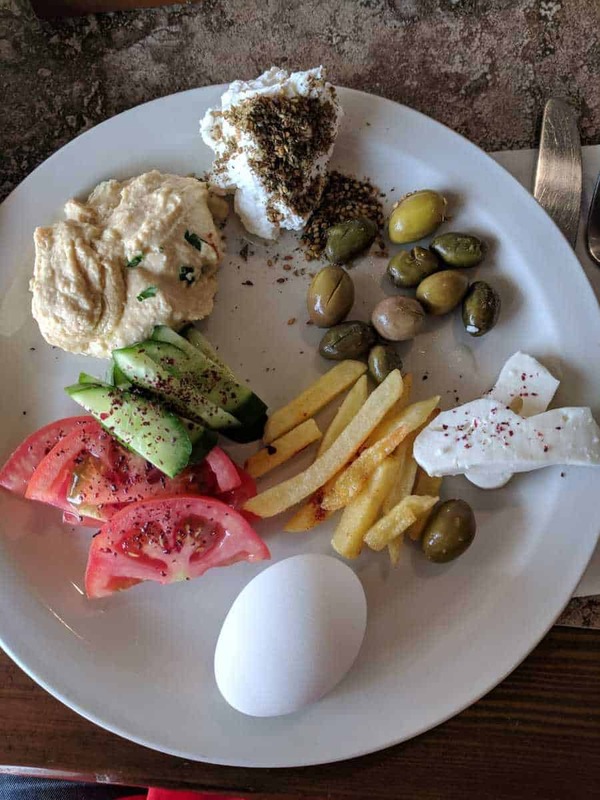 Breakfast staples served at Hotel Nishan, Amman, Jordan: boiled eggs, hummus, labneh, za’atar, olives, fresh goat cheese, veggies & potatoes. I love how the Jordanians have such healthy eating preferences in their culture. However, it was during my recent trip to Jordan that I realized what authentic hummus was supposed to taste like. You see, I’ve whipped a million batches of it in my lifetime, but it was during my time in Jordan (all 10 days of which I shamelessly ordered bowlfuls of hummus, if it wasn’t already provided with the meal 😀 ) that I noticed & fell in love with the fluffy, pillowy, smooth texture of the authentic hummus version. Hummus can be a boon for vegetarians and vegans, owing to its high protein content. The sesame seeds in Tahini are rich in amino acids like methionine, and the combination of pita/ any other bread with hummus is great way to introduce a complete amino acid profile in your diet. 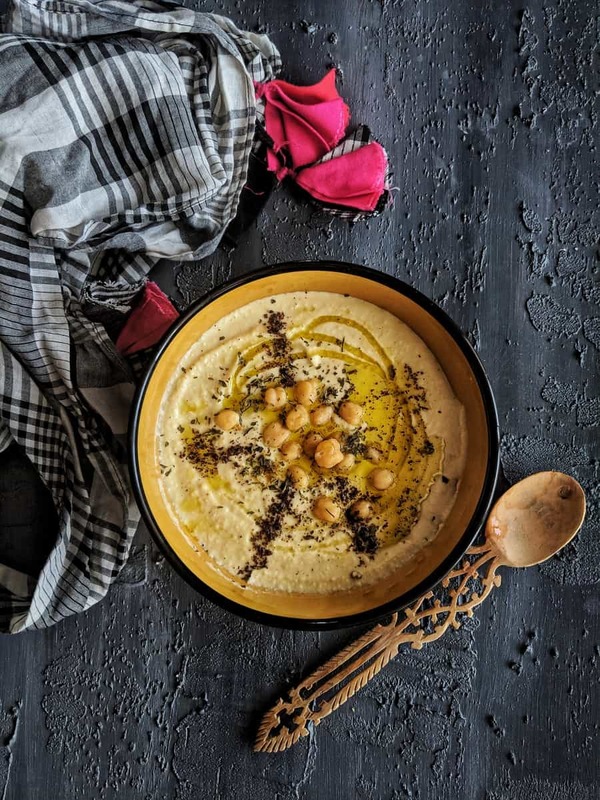 It’s a good way to derive the important micronutrients as well, what with one serving of hummus offering about 7.9 mg vitamin C, 1.6 mg Iron, 29 mg Magnesium, 49 mg Calcium, 170 mg Potassium, 59 mg folate along with 4 gms of fiber. See why I prefer pairing it with idli instead of a podi or chutney? Chickpeas are a very prominent part of Indian cooking and easily available too where I live, which is why I prefer starting with dried chickpeas instead of canned ones, but if access to these is a problem where you stay, you can use the canned ones too. It’s just – I prefer using fresher, original ingredients as much as possible. I also make my own tahini paste, as it’s very easy and I don’t have to worry about the sodium used for preserving the readymade paste. The rest of the ingredients like olive oil, garlic, sea salt and lemon juice etc are pretty much available in every pantry. I keep variating my hummus seasonings from plain to paprika-cumin to peri-peri and basil – you name it. The allure of the classic hummus recipe, however, remains unmatched. 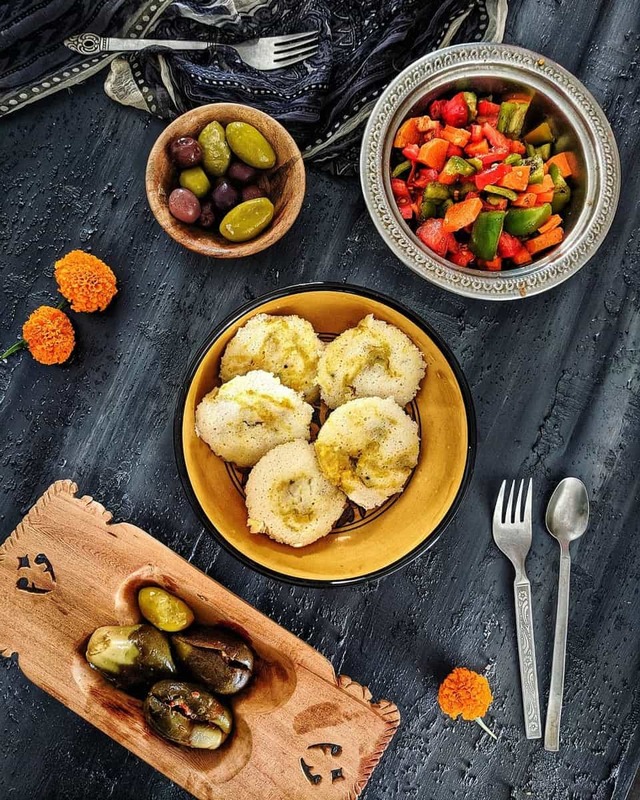 Mango Hummus Idlis, Makdous (pickled eggplants stuffed with chilli paste, tahini and walnuts), olives and veggies – how I roll on some mornings.. 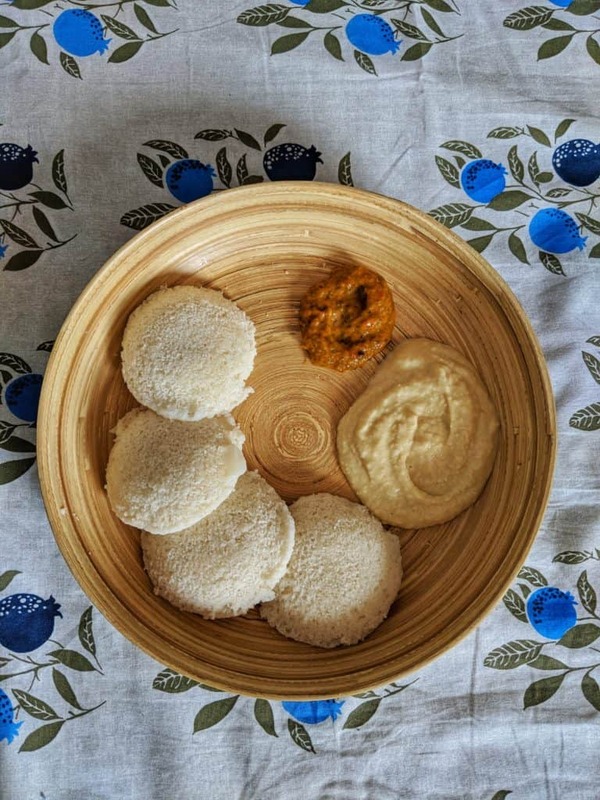 When I’m not whirling in hummus into idli batter, I pair idlis with hummus – delicious & nutritious! Soak chickpeas overnight in water. In the morning, drain the water, rinse and cook with 2-3 garlic cloves – preferably in the pressure cooker or instant pot – until they’re so soft you can easily squish them using your thumb & forefinger. For Tahini, begin with toasting the sesame seeds in a pan over a low flame while stirring constantly. Take care to not brown them, as this will render a bitter flavor. Transfer to a plate and allow to cool. Blend the toasted sesame and sea salt in a small food processor/ grinder jar to a crumbly paste. Next, add the olive oil and blend to a smooth consistency. Set aside. In a food processor jar, add the boiled chickpeas, garlic, salt and puree them to a smooth paste. As it is being pureed, add olive oil slowly to the paste. Add tahini paste, lemon juice, and the remaining olive oil and blend till you achieve a fluffy, smooth paste. Take the required quantity into a bowl and top with some a tablespoon of olive oil. I also season my bowl with sumac, paprika & parsley. For avocado hummus, add chunks of avocado flesh once your hummus is ready and blend. You can made additional amount of tahini and refrigerate for 1-2 months. It makes a great substitute for butter, and can be used for seasoning salads, whirled into brownies etc. *Recipe is for 3-4 servings; all values in grams.